LAB XIV doesn't stop singing! 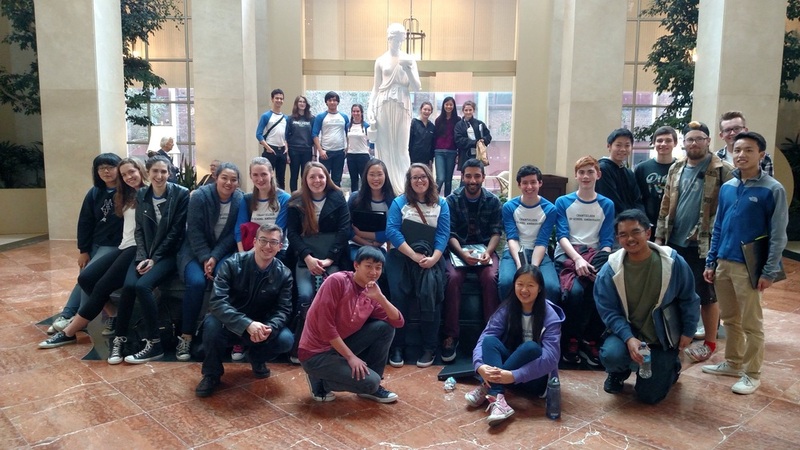 LAB XIV, which officially finished its session in December, regrouped on Sunday for a performance at SF Towers, facilitated by our friend Vance George, Music Director Emeritus of the SF Symphony Chorus, and a great source of support for our education programs. Education Director Ben Johns reports, below. LAB XV is starting up, focussing on the mission music which will be our next project as well. Ben: We managed squeeze the concert, which featured LAB XIV, in the middle of a LAB XV rehearsal. Since there are quite a few singers from LAB XIV doing XV, we staggered our lunch break and had parents ferry us up the hill to the SF Towers. They were concerned that perhaps the audience would not be as full on a Saturday afternoon, but all seats were filled. Vance must have done a great job promoting the concert. LAB XV attended the concert and joined us for a quick preview of the mission repertoire...which resulted in the SF Towers program director asking us to return in the spring, which we hope to do! Following the concert, LAB parents drove us back down (others of us got some exercise and jogged) then went right back into rehearsal.